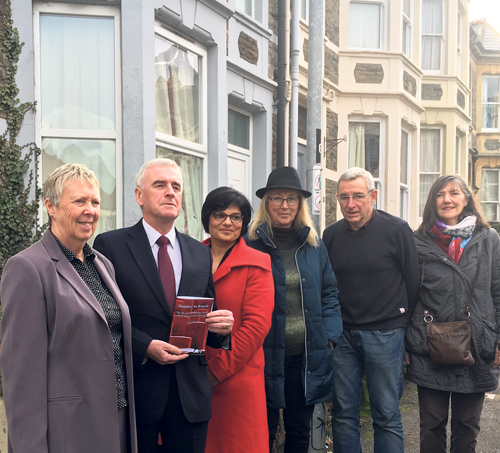 Labour's Shadow Chancellor, John McDonnell MP visited Bristol on February 16, stopping by the blue plaque installed at 2 Station Road in Ashley Down to celebrate the life of conscientious objector and former Bristol North MP Walter Ayles. John McDonnell MP was here with Bristol West MP Thangam Debbonaire to support Labour’s West of England Mayor candidate, Lesley Mansell. He said: "For too long, the West of England has been starved of the investment that is needed to create a fairer and more prosperous economy. "The West of England will benefit with Lesley Mansell as their Metro Mayor as she will be a strong voice for the region and demand the resources from Government that are necessary to build more housing and to create the high-skilled, high-paid jobs of the future. "There is immense potential for our economy in new technology and renewable energy in particular and I'm pleased Lesley has made this one of her campaign priorities." Lesley Mansell, Labour’s West of England Mayoral candidate, said: “It was good of John to join me on the campaign trail. The first election will be held for Mayor of the West of England on May 4 when a candidate will be selected to head the combined authority of Bristol, Bath and North East Somerset and South Gloucestershire councils. The new Mayor will have powers over transport, planning and skills and set out and implement a strategic vision for the economy of the metro area. Other candidates confirmed so far are Tim Bowles, Conservative; ex Bristol West MP Stephen Williams, Liberal Democrat; Darren Hall, Green Party; and Aaron Foot, UKIP. A hustings event is being held on March 22 at 66 Queen Square, 5.30-7pm.